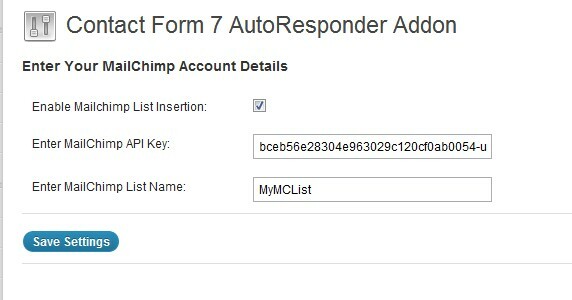 The Contact Form 7 AutoResponder Addon plugin allows you to automatically add people to your MailChimp list after they’ve sent you a message using your CF7 form. This useful little plugin currently supports addition of subscribers to MailChimp lists. In upcoming versions, there will be other AutoResponders added to the functionality subject to feedback and demand. The plugin is easy to use and it uses the submitted email and name fields from the basic CF7 form to insert these details into your MailChimp list. You can also add a checkbox to your CF7 form with the “name” parameter set to “mc-subscribe” with a label saying something like “Subscribe Me To Your List”. This will then give your visitors the option of whether they want to subscribe to your list or newsletter or whatever, after submitting the CF7 form. If this checkbox is present and it is enabled and provided the “Enable Mailchimp List Insertion” is also enabled, the plugin will allow the subscription to occur, otherwise it will not. If by default you do not have the “mc-subscribe” checkbox in your form and the “Enable Mailchimp List Insertion” is also enabled, then subscription will occur by default. FTP the cf7-autoresponder-addon folder to the /wp-content/plugins/ directory, OR, alternatively, upload the cf7-autoresponder-addon.zip file from the Plugins->Add New page in the WordPress administration panel. 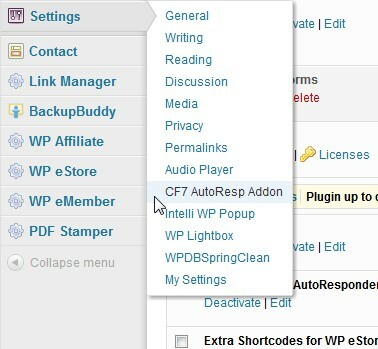 Activate the cf7-autoresponder-addon plugin through the ‘Plugins’ menu in the WordPress administration panel. The forms which you want to use to add people to your MC list have been configured via the Contact Form 7 plugin. Enable the check-box called “Enable Mailchimp List Insertion”. This will activate the automatic insertion of people to your MailChimp list when they send you a message via the Contact Form 7. Note: Your MailChimp API Key can be obtained when you log into your MailChimp account. It can be found under the “Account” tab. By default the API Key is not active so make sure you activate it. Enter your MailChimp list name. Note: You would have specified this in your MailChimp account when you created the list. Ensure that you enter the correct name because if you mispell the name or provide an incorrect list name, the CF7 AutoResp Addon plugin will not be able to add your client to your list. And that’s it! Now whenever anyone leaves a message on your site using the Contact Form 7, they will automatically be added to your MailChimp list, OR, you can give your visitors the choice to subscribe by using the checkbox described in the pre-requisites section. Please be aware that in order for someone to be added to your list, they will firstly need to confirm the subscription by clicking on the appropriate link in the “confirmation” email which is sent by MailChimp. Normally people are subscribed to the global AWeber, GetResponse or MailChimp list names which are specified in the main settings of this plugin. However if for example you have more than 1 list in your AWeber or GetResponse or MailChimp accounts and you wish to add people the different lists, you can do so with this plugin based on the form you are using. For example if you have 3 different CF7 forms on your site, you can use each form to add people to 3 separate lists whereby each CF7 form can be configured to specify an autoresponder list name. To do this you simply need to modify the submit button code of the relevant CF7 form by adding an extra parameter. Note that we’ve simply added a “pipe” character “|” followed by the list name which in our example is called “wpsolutionslist1” to the name of the button. The above method will allow you to subscribe people to specific list names based on the CF7 form they are using. This means you can conveniently insert people to more than one list depending on the form they fill in. Sometimes you may want to add more information to your mailchimp list in addition to email and names. 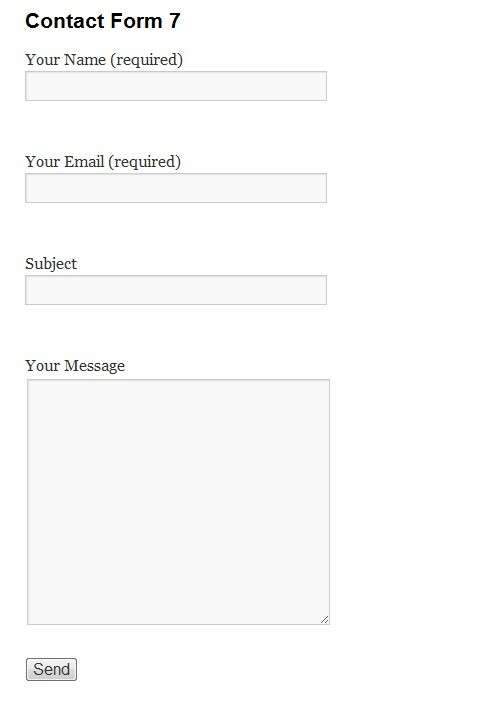 Step 2 – In your Contact Form 7 settings add a new field which will represent the merge tag you want to insert into mailchimp. The above name consists of two parts: a prefix MCTAG- and the actual merge var tag name which you got from your mailchimp account in step 1, ie, “CITY”. IMPORTANT: You MUST follow the above format when adding additional fields in which you want to insert into your mailchimp list. The fieldname must always have the MCTAG- prefix followed by the merge var tag value. 2) Below is my code in CF7 forms. Behind scenes all is working. I get CF7 email and autoresponder addon gets the info into my MC account as expected. However, on WP site the “hour glass” processing never goes off next to send button. I dont get the success message. it appears unsent to user.